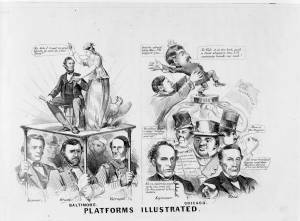 In this print the Democratic National Convention in Chicago is unfavorably compared to the Republican convention in Baltimore in June of the same year. The artist is especially critical of prominent New York Peace Democrats Horatio Seymour and Fernando Wood. The party’s espousal of a truce with the South is presented here as advantageous to the Confederacy and to Great Britain.